Top quality that won't blow your budget! The Dickinson® XX3B-2 is designed and manufactured in a state-of-the-art facility located in Huglu, Turkey. Here, they combine a blend of old-world craftsmanship with modern technology to create a firearm that's lightweight, reliable and extremely accurate. This partnership is what makes the XX3B-2 a Dickinson and not just another ordinary shotgun. 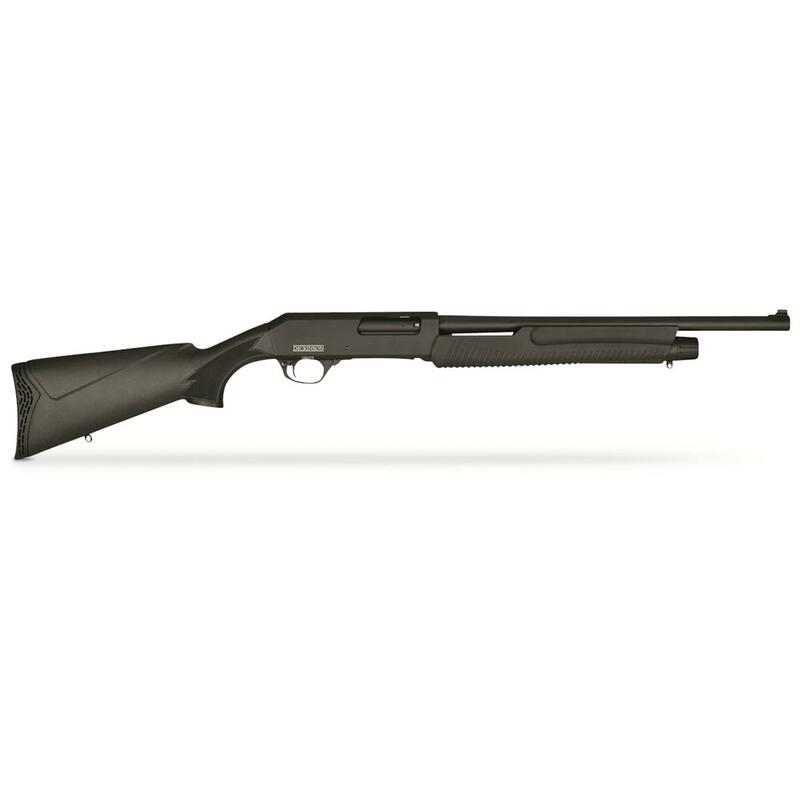 Dickinson Commando XX3B-2, Pump Action, 12 Gauge, 18.5 Barrel, 5+1 Rounds is rated 4.9 out of 5 by 11. Rated 5 out of 5 by Jeff from Still happy! Just received my 3rd, and it works flawlessly like the first 2. Rated 5 out of 5 by Jeff from The Turks are upping their game If you can get past the "Made In Turkey" inscription on the barrel, you'll love this shotgun. I've just ordered one from SG, and it will be my second. I purchased my first from a LGS for $150 plus tax, the last one my dealer had. In the last two weeks it's ground up 200 rounds of cheap birdshot and 50 rounds each of buckshot and Foster slugs without a single problem. Fit and finish are surprisingly good and equal to, or better than matte finished Mossberg and Remington offerings. Field stripping and reassembly is fast and easy, and cleaning/maintenance is a snap with the chrome bore and chamber. Unfortunately, it does NOT have a "clean out" magazine tube as it makes use of a captured spring. But all in all, it's an amazing value and an excellent HD, feral pig, truck gun, etc. Rated 5 out of 5 by Mike D from Very good value! An awful lot of shotgun for the money. Heck,the case alone is worth 40 bucks! I cleaned it and took it to the range and gave it(and my 67 year old shoulder) a good workout. Birdshot,buckshot,slugs...cheap ammo...expensive ammo and not one issue This gun is way more quality than I expected for the price! This is my 3rd firearm that was made in Turkey and they all follow the pattern of great quality,built to shoot reliability,and plenty of gun for the pricepoint. Remember when Makarovs were selling for 90-100 bucks in the nineties? My advice is to grab one or two of these before they go up to $ 400!!! Rated 5 out of 5 by Mag253 from Great shotgun for the price! Glad I got this when I did cause now there sold out. Light and well balanced reminds me of the 870 we carried in the squad cars. When the come back in stock get one while you can! Thanks Sportsman's Guide! Rated 5 out of 5 by RANDY from GREAT DEAL ON GREAT GUN!! WOW!! WHEN I SAW THIS 12GA. PUMP FOR $142, I THOUGHT IT WAS A TYPO! THIS SHOTGUN IS PERFECT FOR HOME DEFENSE. THIS SHOTGUN IS WORTH $275-$300 EASY! I GOT IN TOUCH WITH DICKINSON, AND BOUGHT A FOLD AWAY PISTOL GRIP STOCK FOR IT. I LOVE THIS GUN, AND HIGHLY RECOMMEND IT!! YOU CAN'T FIND A GOOD PELLET GUN FOR THIS PRICE!! LOL! Rated 5 out of 5 by Bodacious87 from Great for the money! I had never even heard of Dickinson, but after doing a little research it seems they are a decent company based out of Turkey that is known for making very exceptional semi-auto shotguns that are inertia driven. I paid $140 bucks out the door for this little pump 12 gauge... and it turned out to be a great decision. Wouldn't mind another one. It really is a pretty decent pump shotgun and considering it cost me $140 at S.G. and I've saw them for $289 at gun shows... Not a bad deal! My only critique is the loading port is a little weird. The lever is just a bit short and you can get shells stuck underneath it if you are not careful when loading. But overall, this is an excellent "shotty" for the money. It would make a great home defense gun for those on a budget or a really nice gun for a beginner hunter. 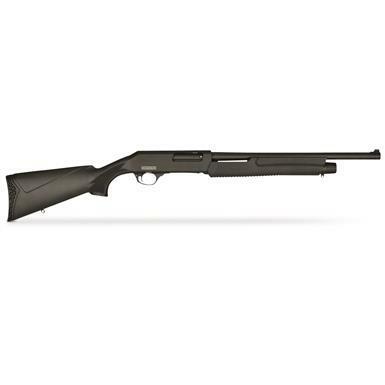 Dickinson XX3B-M-2 Marine, Pump Action, 12 Gauge, 18.5"
H&R Pardner Protector, Pump Action, 12 Gauge, 18.5"